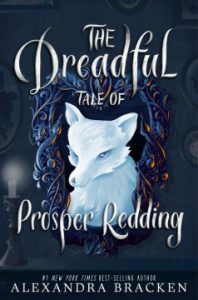 I thoroughly enjoyed reading The Dreadful Tale of Prosper Redding in the weeks leading up to Halloween and think it will be a great slightly-creepy tale for any middle grade student. As with many Jekyll/Hyde characters, I was more charmed by the demon (Alastor, potential heir to the underworld) than by the human (Prosper, the least valued member of his illustrious family). When the two worked together to achieve some joint goals the narrative was infinitely fun.